Home / Deals / Subaru Leave the extra costs in the dust! *Prices include GST. Offer: Complimentary Subaru 3 Year Service Plan and complimentary On-Road Costs. 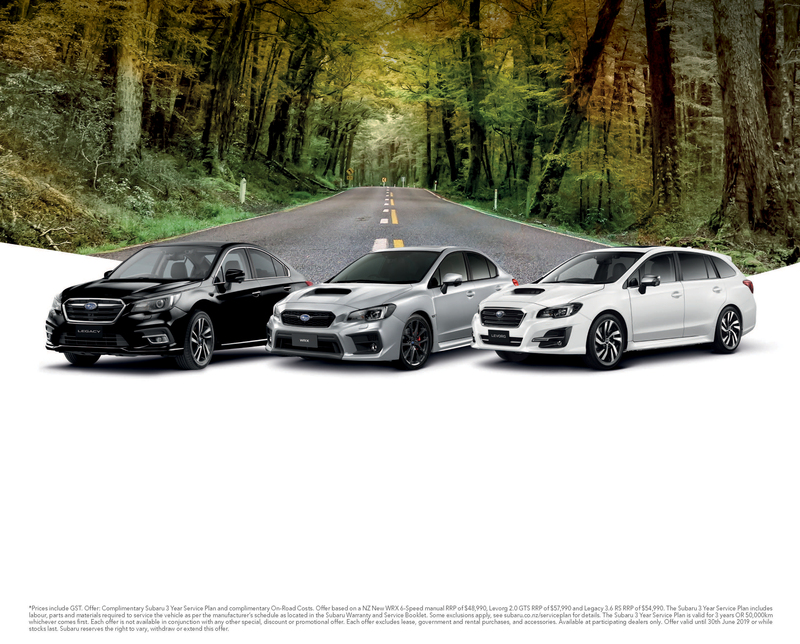 Offer based on a NZ New WRX 6-Speed manual RRP of $48,990, Levorg 2.0 GTS RRP of $57,990 and Legacy 3.6 RS RRP of $54,990. The Subaru 3 Year Service Plan includes labour, parts and materials required to service the vehicle as per the manufacturer’s schedule as located in the Subaru Warranty and Service Booklet. Some exclusions apply, see subaru.co.nz/serviceplan for details. The Subaru 3 Year Service Plan is valid for 3 years OR 50,000km whichever comes first. Each offer is not available in conjunction with any other special, discount or promotional offer. Each offer excludes lease, government and rental purchases, and accessories. Available at participating dealers only. Offer valid until 30th June 2019 or while stocks last. Subaru reserves the right to vary, withdraw or extend this offer.